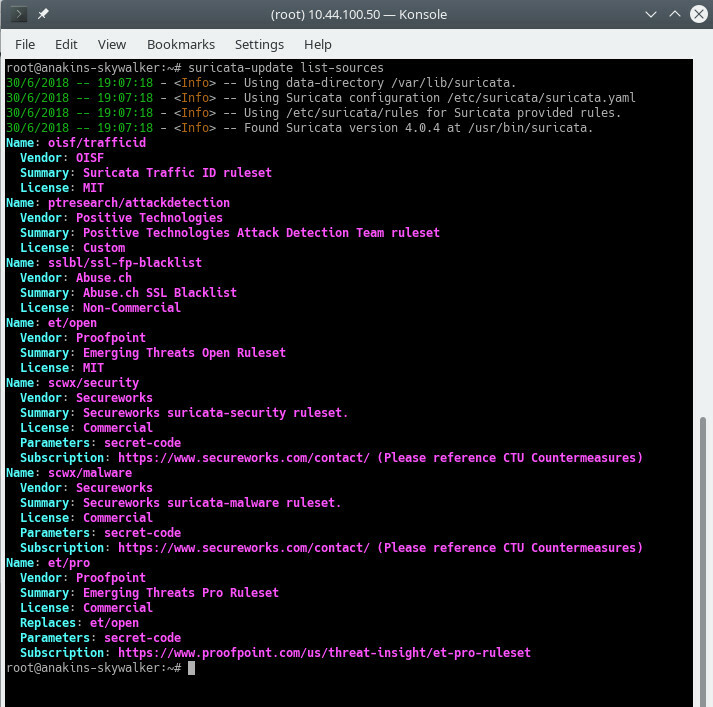 Suricata is an IDS / IPS capable of using Emerging Threats and VRT rule sets like Snort and Sagan. 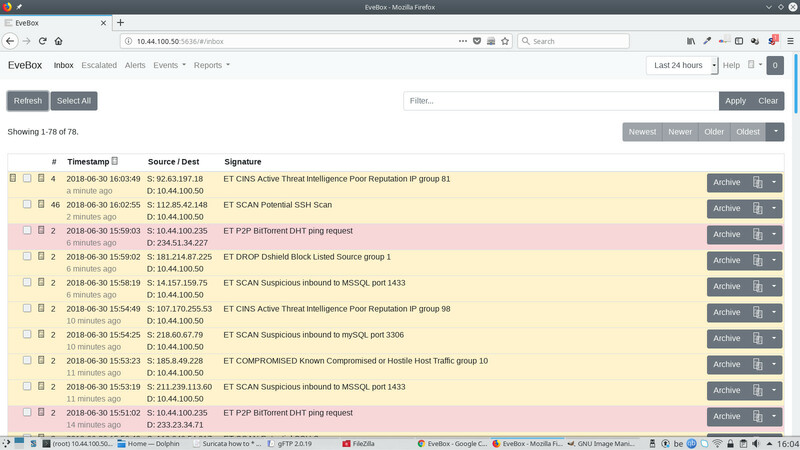 This tutorial shows the installation and configuration of the Suricata Intrusion Detection System on an Ubuntu 18.04 (Bionic Beaver) server. In this howto we assume that all commands are executed as root. If not you need to add sudo before every command. Since eth0 is hardcoded in suricata (recognized as a bug) we need to replace eth0 with the correct network adaptor name. And note (copy) the actual network adaptor name. And replace all instances of eth0 with the actual adaptor name for your system. Now we install suricata-update to update and download suricata rules. Without doing any configuration the default operation of suricata-update is use the Emerging Threats Open ruleset. Look for the suricata program in your path to determine its version. Look for /etc/suricata/enable.conf, /etc/suricata/disable.conf, /etc/suricata/drop.conf, and /etc/suricata/modify.conf to look for filters to apply to the downloaded rules.These files are optional and do not need to exist. Download the Emerging Threats Open ruleset for your version of Suricata, defaulting to 4.0.0 if not found. Apply enable, disable, drop and modify filters as loaded above. Write out the rules to /var/lib/suricata/rules/suricata.rules. 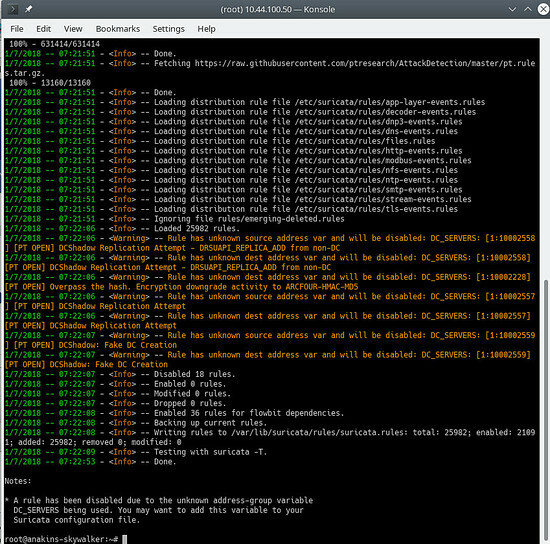 Run Suricata in test mode on /var/lib/suricata/rules/suricata.rules. Suricata-Update takes a different convention to rule files than Suricata traditionally has. The most noticeable difference is that the rules are stored by default in /var/lib/suricata/rules/suricata.rules. This will be the future format of Suricata so using this is future proof. This command will updata suricata-update with all of the available rules sources. Now we will enable all of the (free) rules sources, for a paying source you will need to have an account and pay for it of course. When enabling a paying source you will be asked for your username / password for this source. You will only have to enter it once since suricata-update saves that information. And update your rules again to download the latest rules and also the rule sets we just added. Disabling a source keeps the source configuration but disables. This is useful when a source requires parameters such as a code that you don’t want to lose, which would happen if you removed a source. Enabling a disabled source re-enables without prompting for user inputs. This removes the local configuration for this source. Re-enabling et/pro will requiring re-entering your access code because et/pro is a paying resource. First we add the elastic.co repository. Beacause these services do not start automatically on startup issue the following commands to register and enable the services. If you are short on memory, you want to set Elasticsearch to grab less memory on startup, beware of this setting, this depends on how much data you collect and other things, so this is NOT gospel. By default eleasticsearch will use 1 gigabyte of memory. There is a bug in the mutate plugin so we need to update the plugins first to get the bugfix installed. However it is a good idea to update the plugins from time to time. not only to get bugfixes but also to get new functionality. Now we are going to configure logstash. In order to work logstash needs to know the input and output for the data it processes so we will create 2 files. And paste the following in to it. Paste the following config into the file and save it. This sends the output of the pipeline to Elasticsearch on localhost. The output will be sent to an index for each day based upon the timestamp of the event passing through the Logstash pipeline. Kibana is the ELK web frontend which can be used to visualize suricata alerts. Kibana requires templates to be installed in order to do so. 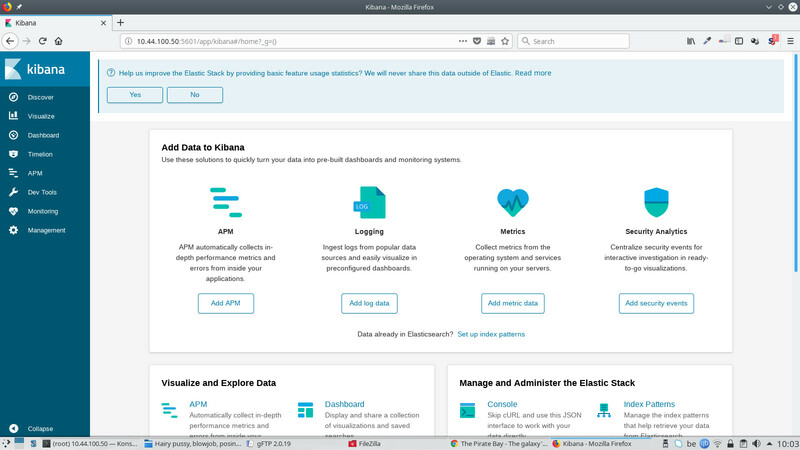 Stamus network have developped a set of templates for Kibana but they only do work with Kibana version 5. We will need to wait for the updated version that will work with Kibana 6. Keep an eye on https://github.com/StamusNetworks/ to see when a new version of KTS comes out. You can of course make your own templates. Evebox is a web frontend that displays the Suricata alerts after being processed by ELK. Filebeat allows you to send logfile entries to a remove logstash service. This is handy when you have multiple instances of Suricata on your network. Than we need to edit the filebeat configuration and tell it what we want filebeat to monitor. And set the following to send the output to logstash and comment out the eleasticsearch output. Scirius is a web frontend for suricata rules management. The open source version only allows you to manage a local suricata install. Before we start scirius you need to give the hostname or ip address of the machine running scirius to avoid a Django error stating host not allowed and stopping the service, and disable debugging. You can add both the ip address and hostname of the machine by uting the following format: [‘ip’,’hostname’]. You can than connect to localhost:8000. And than you can go to scirius.example.tld and access scirius from there. This concludes this how to.